Dr. Reinhardt’s philosophy, in practice and in life, is to always keep the body and mind moving. When faced with the uncomfortable obstacle of back pain and/or a herniated or bulging disc, it’s difficult to maintain a healthy lifestyle. We commonly use this nonsurgical treatment with patients experiencing bulging discs, pinched nerves, sciatica pains, and numbness/tingling down the arms. 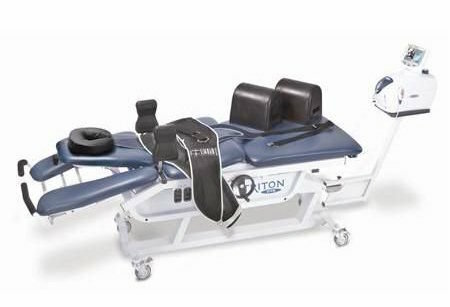 This specialized table stretches the spine to “decompress” the spine by taking pressure off the injured discs and/or spinal nerves that are pinched. This procedure is very effective in preventing spinal surgery for herniated discs. Too often patients rush into surgery when conservative care such as chiropractic, spinal decompression, and physical therapy should be tried first. We have helped many patients prevent surgery through our protocols. The procedure takes about 20-30 minutes per visit, it’s pain-free, and feels like a “gentle stretch”. 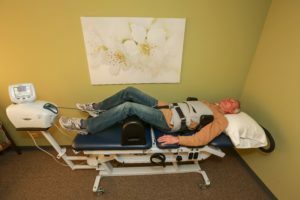 Nonsurgical Spinal Decompression is a very effective treatment for bulging or herniated discs, sciatica pain, numbness into the arms and/or legs, and pinched nerves in the neck or lower back. This treatment takes pressure off the pinched nerves and other structures by gently stretching the spine. This helps promote movement of water, oxygen, and nutrient-rich fluids into the discs (cushions of the spine) so they can heal faster.